As expected, Singtel made official their iPhone plans tonight. You can check out the plans here but they are not too different from what was originally leaked this afternoon. 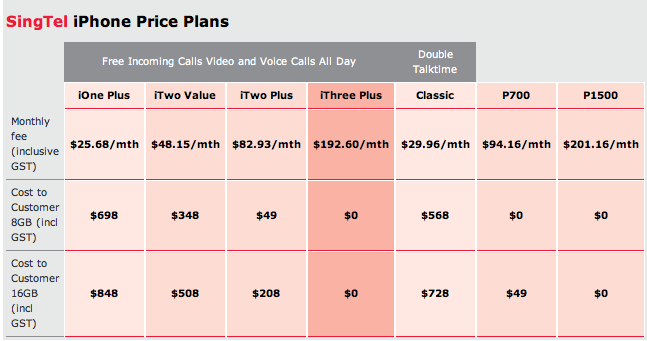 I am going for the iOne plan and will be paying $850 singapore dollars for an originally advertised as USD$299 phone. Then again, if you consider the fact that to Singtel, the raw cost of the iPhone 16GB is $1200SGD (from their contract-free Optus sale), paying $850 dollars for the 16GB iPhone while signed to a 2 year contract is decent actually, for we get a “rebate/discount” of $350 dollars. Edit: Apparently they are trying to trick Singaporeans with their confusing BBoM policies. Check the post above for more details.